The day before his 300m race at the Golden Spike meeting in Ostrava, South Africa’s world 400m record-holder and Olympic champion Wayde van Niekerk had said he planned to “go out there and be ridiculous and see what happens”. That’s exactly what he did. Further proving his immense talent, the 24-year-old clocked 30.81 to break Michael Johnson’s 17-year-old world best of 30.85, adding to a list of PBs which includes a 9.94 100m, 19.84 200m and 43.03 400m. The previous meeting record had been 30.97 set by a certain Usain Bolt in 2010. In March 2016, Van Niekerk hit headlines as the first athlete to go sub-10 seconds for 100m, sub-20 for 200m and sub-44 for 400m. Now he has added a sub-31 300m to that list and it surely won’t be long until he dips under 43 seconds for 400m. Among those in Ostrava to witness Van Niekerk’s feat on Wednesday evening had been Bolt himself. The men’s 100m was the final track event on the programme, just before the special farewell ceremony for the Jamaican sprint star who is set to retire later this summer. Bolt delighted the crowds with his 10.06 for victory, but it didn’t look as comfortable as might have been expected. 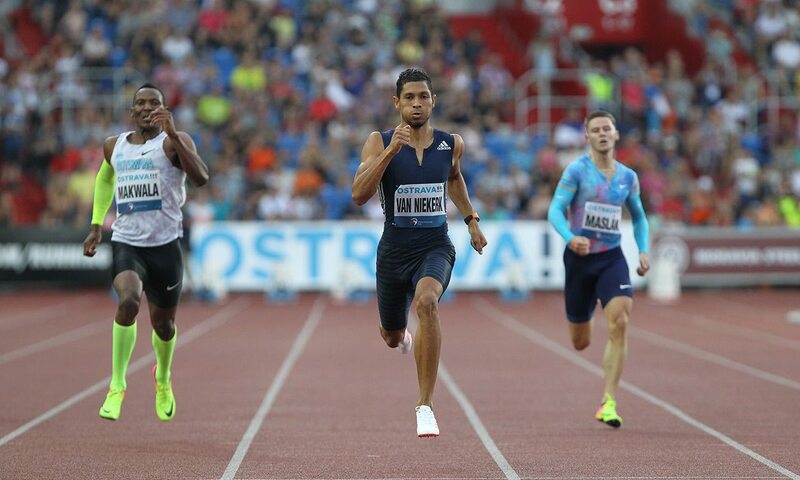 After a sluggish start, he powered ahead to hold off Cuba’s Yunier Perez with a 10.09 PB. “I’m not happy with the time, but I’m just getting into my running,” said Bolt, who also added that he would be getting checked out by his doctor. He didn’t rush off after the race, however, remaining trackside for photographs and autographs before an attempt at the long jump. Britain’s Mo Farah was another multiple Olympic and world champion in action and his 10,000m win seemed more convincing as he clocked 27:12.10 to beat Kenyan 19-year-old Mathew Kimeli with 27:14.43. Farah has now won all but two of his 13 10,000m races during his career, with a winning streak dating back to 2011. For Kimeli, who surged ahead just before bell but was easily reeled back in by Farah, it was a PB performance which improves on the 27:53.9 he ran in Nairobi earlier this month. After his defeat at last weekend’s European Team Championships, Olympic javelin champion and 93.90m man Thomas Röhler was back to winning ways as he became the first since Andreas Thorkildsen in 2006 to have three 90m-plus competitions in a single season. He didn’t restrict himself to just one 90 metre throw, either, as he recorded his winning 91.53m in the second round and followed that up with 91.02m in round three to beat fellow German Johannes Vetter with 87.88m. There were meeting records in the men’s triple jump and women’s 1500m as two-time Olympic and world champion Christian Taylor soared out to 17.57m for victory ahead of Troy Doris’ 16.80m, while Ethiopia’s Gudaf Tsegay clocked 4:00.96 for her 1500m victory. Marie-Josée Ta Lou of Ivory Coast won the 200m in 22.44, while Germany’s Pamela Dutkiewicz won the 100m hurdles in 12.72 and France’s Garfield Darien clocked a PB of 13.09 to secure victory in the 110m hurdles and move to second on this summer’s world rankings. Kenya’s Nicholas Kipkoech held off Czech Republic’s Jakub Holusa in the 1000m, 2:18.51 to 2:18.60, as world 800m record-holder and two-time Olympic gold medallist David Rudisha ran 2:19.43 for fourth in what was the furthest race of his career so far. Benjamin Kigen won the 3000m steeplechase in a PB of 8:11.54 from Getnet Wale’s 8:13.16. Russia’s Anzhelika Sidorova won the pole vault with her clearance of 4.70m, while Poland’s Sylwester Bednarek secured high jump success with a PB-equalling mark of 2.32m. Shot putter Tomas Stanek of Czech Republic continued his winning ways after his victory at the European Team Championships, throwing 21.63m.